I’ve rapidly become a huge fan of Dan Sheffler’s workflow. One thing that I’m really looking forward to trying out is is ‘Zettelkasten‘(also here), a kind of flat wiki-like approach to note taking. 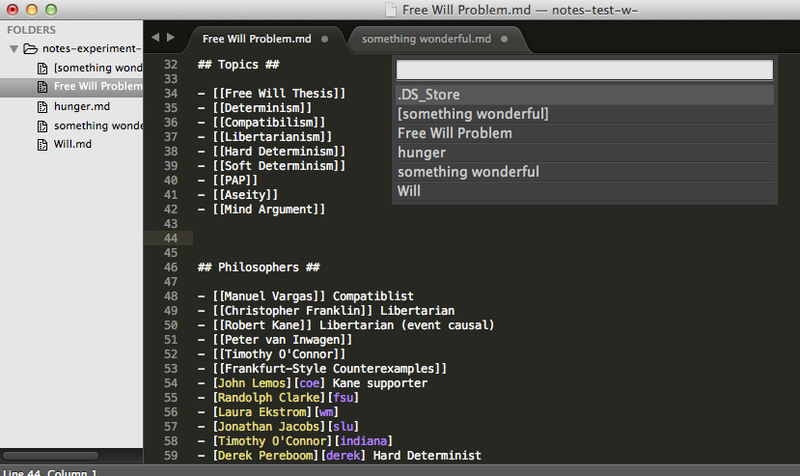 I have always struggled with effective notetaking, but combining his markdown export from pdfs (via Skim) with the zettelkasten (which I could then push to github for open-notebooking purposes, or feed to Jekyll, or text mining, etc) has me (geek that I am) rather excited about the prospects. 1. Install Sublime Text 3. 2. Download the MyWiki zip from Dan’s repo on Github. 3a (because I forget this step when I first published this post: Install Bracketeer plugin; go to preferences – package control – install packages – type in ‘bracketeer’, select it, hit enter). 4. Open Sublime Text 3. 5. Under Preferences, go to ‘browse packages’. This opens the package location in your finder. 6. Meanwhile, unzip the MyWiki plugin. Copy the MyWiki folder to the package location. I had trouble getting Sublime 3 to recognize the ‘keymap’, that is, the file telling Sublime what keys fire up what commands in the MyWiki.py file. I renamed it to ‘Default (OSX).sublime-keymap’ which should’ve solved the problem, but didn’t. 7. So instead, I went to Preferences – key bindings – user, and copied the text of Dan’s file into this default one. I saved everything, restarted sublime text, and voila! Hard to see it, but I’ve just typed [[ in a markdown document, and an autocomplete with all of the file names (that is, notecards) appears so that I can ensure consistency across my files or create a new note.